As darkness settled over the West Virginia countryside a group of young scientists walked beneath the towering dishes of the National Radio Astronomy Observatory. Faint radio signals from across the universe reflect off these dishes to reveal the secrets of pulsars and black holes. But these scientists weren’t astrophysicists or even graduate students. The professional astronomers found 35 previously unknown pulsars in the survey’s 134 terabytes of data. These rapidly spinning stellar remains sweep beams of radio waves across the universe like a lighthouse above a storm-swept cliff. Astrophysicists study these repeating flashes to understand stellar evolution, the vast space through which the signals travel, and to find so-far elusive gravity waves. By giving the students access to their own 30 terabyte dataset, the Pulsar Search Collaboratory lets them make a similar contribution to science. 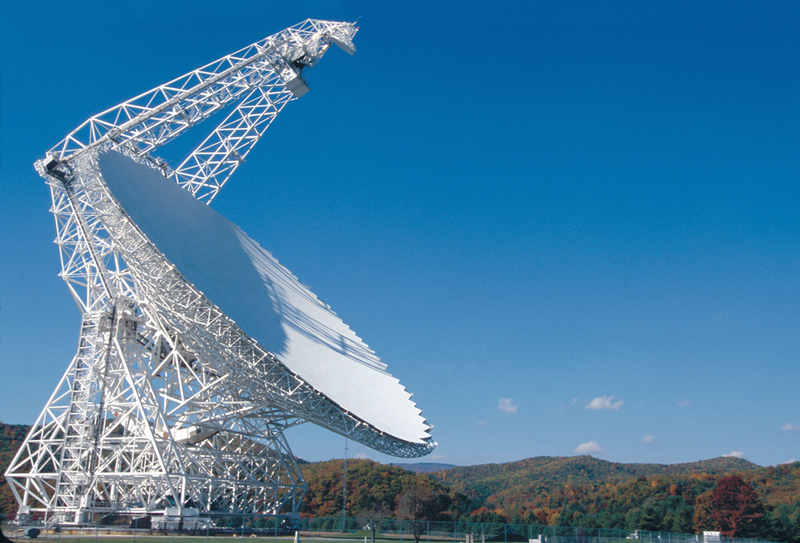 Teachers and students attend a week-long workshop at the NRAO where they learn the physics of radio astronomy as well as how to collect and analyze data with the observatory’s radio telescopes. This year the National Radio Astronomy Observatory announced the latest student discovery - a pair of neutron stars orbiting each other at the widest distance ever recorded. Cecilia McGough is one of the 25 students listed as a co-author on the paper recently accepted for publication by the Astrophysical Journal (arXiv: 1503.06276). Cecilia explained how her experience with the Pulsar Search Collaboratory shaped the direction of her career. Cecilia is now a physics major at Pennsylvania State University where she founded the Penn State Pulsar Search Collaboratory. She modeled the group on her own pulsar search experience, so that undergraduates can do high level research even if they are only freshmen. The program also enhances the mentors’ careers. As Joe explained, “I’ve done a lot of the proposal writing, follow up observations, and writing papers related to the students’ discoveries.” In fact, Joe was the lead author for the latest pulsar discovery - an important asset in the career of a young scientist. A 2010 paper documented the program’s broader impact (DOI: 10.3847/AER2010004, arXiv preprint: 1005/1060). After participating in the PSC, the study found, the students were more interested in STEM-related careers. Girls especially became much more confident in their abilities. Many of the schools taking part in the program were in rural or low-income areas where a majority of students were eligible for the National School Lunch Program. A significant number of the students planned to be the first in their families to go to college. Programs like the Pulsar Search Collaboratory have profound effects on the lives of future scientists like Cecilia and Katya. It gives them hands-on experience with actual scientific research. They get to see that science is a messy exploration rather than the straightforward trek to the right answer of most classroom exercizes. They also learn personal lessons that follow them through their academic careers. A new documentary called "Little Green Men" will delve deeper into the Pulsar Search Collaboratory's impact on the lives of aspiring scientists. Supported by a National Science Founduation grant, the documentary shows what a difference pulsar science can make - both for science and for the students themselves. Scientists like Jocelyn Bell-Burnell, the first pulsar discoverer, describe the physics of pulsars and radio astronomy. Students who participated in the Pulsar Search Collaboratory describe their experiences and the thrill of discovery. You can watch a preview at the Little Green Men site. June 1 Update: The correct number of new pulsars discovered by the 350MHz Drift Scan Survey is 35, not 7. The correct number of students listed as co-authors is 25, not 2.